The winners of the free copies of this great book - read more about it HERE - should have received their parcels by now. If you did (or indeed if you won a copy in our giveaway of the hardback edition last year) do please add a question for author Hannah Kent. Hi Hannah, you have set this book in Iceland - do you have connections with the country or have you visited it? I fell in love with it when I went there! I was so pleased to get my copy the other day and am looking forward to reading it. I have quite a strong connection with Iceland. When I was 17 years old I travelled to a small village in northern Iceland as an exchange student. I lived there for 12 months, learned Icelandic, participated in the community and school life, and fell deeply in love with the country. I've since returned to Iceland around five or six times, mainly to visit the friends I made there, but also to research Burial Rites. It's a country that I continue to feel homesick for, even when living in my home country of Australia. I feel very connected with the culture and landscape there. Thank you from me too. I've just started reading it and am already engrossed in another world during a different time. My only questions so far are about why did Hannah Kent choose to go all the way to Iceland at 17 (or was she just sent?) and how long did it take her to learn Icelandic? I'm sure I'll have book based questions once I've read more of it. When I was 17 years old, I decided to apply for a Rotary Exchange Program. I had just completed high school and, anxious about immediately embarking on a university degree, I decided to have a year of adventure instead. Rotary doesn't actually allow applicants to choose their exchange destinations. Rather, applicants are invited to nominate three countries they would like to be considered for. My choices – Sweden, Iceland and Switzerland – were selected because I had never seen snow before, and I longed to experience a white winter. I believe Rotary chose Iceland for me because I was one of the few applicants enthusiastic about a winter with extremely limited daylight. It took me about six months to get a grasp on Icelandic. By the time I returned to Australia I was more or less fluent, but that was because I had worked rather hard to learn the language. I'm quite rusty now. Unfortunately I have few opportunities to practice Icelandic in Australia. Thank you so much for the book. I am really looking forward to starting it. How does Hannah go about her writing? Is it like turning up for work and putting in the hours or done in a different way? It depends on whether I'm researching or writing. Research, due to its tangential and sometimes unpredictable nature, requires rather odd hours – I don't have much of a routine. When it comes to writing however, I try to be as disciplined and as professional as possible. I have found that I'm a morning person, and so I like to begin work no later than 8am. I try to write 1000 new words each day. The theory behind this practice is that it helps me develop momentum and lay the groundwork of a story that can later be edited or rewritten. It also means that, on some days, I'm free to do other work or chores by 11am because I've reached my quota. Unfortunately, on other days, I'm still in my study by nightfall. Either way, at the end of a fortnight, I'll have at least 10,000 words to revisit later. I finished this fabulous book today and it has made a lasting impression on me. The bleak cold and dark of the Icelandic winter climate and the boring diet were described so cleverly and linked in with the barbaric treatment Agnes received, virtually throughout her life. I hoped against hope, right until the final chapter that she would be spared her fate. I would like to ask Hannah if she intends to write more books featuring Iceland and also if she favours historical time frames? I would like to write more books set in Iceland, but I have no immediate plans to do so. My next novel will be set in Ireland, and will also be historical. The decision to write about the 19th century (the setting of this next book, too), is not out of any conscious desire to be a historical novelist, but is coincidental: the stories I have found fascinating enough to research and write about just happen to be set in the last century. I would certainly look out for another novel by Hannah Kent, does she intend writing more? She has spent many years researching and writing this book, does she think she will use her knowledge of Iceland to set further books there or will she use her talent for research to explore entirely different topics for future books? Thank you to Hannah! Thank you granniepam! I do intend to write more novels – in fact, I'm working on my next one at the moment. I would like to one day return to Iceland as a setting for future books, especially as I've done so much research about that country, but there's nothing planned at the moment. My next novel will be set in Ireland, and I'm enjoying researching that country's history very much. I quite enjoy exploring unfamiliar ground. I would like to ask Hannah how long after finishing the novel did she feel she had left Agnes behind of does she still feel entwined with her somehow? It's a good question. To be honest, I don't feel that I have left her behind at all. Even though I have finished writing Agnes's story, I still carry her with me. I think I always will. My question to Hannah would be: How did you choose the title? I would like to ask how Hannah decided on the title for the book? Hello grandmac and pennwood. The working title of the manuscript was not Burial Rites but Agnes. I knew, however, that I didn't want this as the final title – I felt the book was about more than just my protganist, and I wanted the title to reflect this. 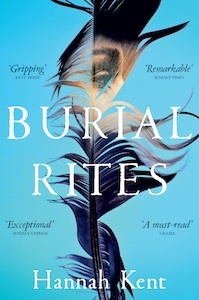 Burial Rites is a reference to the many letters that were sent between the authorities regarding how they ought to bury the murdered men and the convicted. Who has a right to bury some and not others? Why do some deserve Christian rituals and others do not? The title is also suggestive of the instances in the novel where people can or cannot be buried due to the seasons, or other factors. It is also a title with a hidden reference. Over 150 years after her death, some strange events occurred which resulted in the re-burial of Agnes Magnusdottir's bones. Some Icelanders might know the story (which involves the supernatural), but it's one I don't feel I have the authority to tell. I really enjoyed this book and Hannah Kent's style of writing. The strong images of Icelandic culture, it's seasons and the sheer grind of day to day life for the poorer folk really set the scene for the unfolding story of Agnes and the search for the truth about the murders. My question is how much did reading the sagas influence your writing style? Thank you, grannybug. I'm so pleased to hear it. I read many of the Icelandic sagas during my research of Burial Rites, and they have influenced certain aspects of it, although perhaps not the writing style as much as characterisation. I was struck by the stoicism, laconism and belief in fate demonstrated by many of the saga figures, and reproduced many of these traits in my own characters – particularly those who would have been fond of the sagas themselves. Agnes alludes to Laxdaela Saga thoughout the narrative, and this was quite intentional. There are certain similarities and parallels between Agnes's life and the protagonist of this particular saga, and I wanted to draw attention to these. Initially I found this book hard to get into, but I'm so glad I persevered. The developing relationships between characters are beautifully crafted. Are you planning any more books based on historical characters? Having visited Norway many times I've completely fallen for the country; do you feel the same way about Iceland? Yes, my next book will be based on a true story that occurred in Ireland in the 1820s. I'm reluctant to say too much about it, because it's still so early in the project. You'll have to wait and see! I have a feeling that your regard and love for Norway absolutely matches my own adoration for Iceland. I am homesick for that country every day. I would like to thank the author too and ask if she thinks it would ever be made into a film or a tv programe? Also does she know how the 2 females Agnus and Sigga didn't get pregnant did they use some sort of herbs in those days? Hello weather. The film rights to Burial Rites have been picked up by Lionsgate, and Jennifer Lawrence has committed to playing the lead role. It probably won't be made for some time, but it is in the pipeline. I won't be writing the screenplay or having a great deal to do with it, but am more than happy for others to reinterpret my book for screen, as I have reinterpreted Agnes's story for a work of fiction. I'm not too sure why Agnes or Sigga didn't get pregnant, or whether they concocted a preventative or abortive medicine. A 1995 film about the events, Agnes, depicted Agnes as having an illegitimate daughter, and for many months I scoured the records for evidence of this. I found nothing. Given that the film made several other liberties with the historical facts, I believe that Agnes died childless. I too hope the story stays true if a film is made and my question would be who would you wish to play Agnes would it be an actress who we are familar with, and how long before your next novel is released and do you have an idea for it already. Jennifer Lawrence has committed to playing Agnes in the film adaptation (which is currently in pre-production), which I think is wonderful – she is an exceptional actress. I never really gave much thought to who I would like to see in the role. Agnes is still, in my mind, the same figure I pictured when writing the novel. That won't change for me. I'm not sure when my next novel will come out, but I am working on it at the moment. Hopefully not too long! I won't say too much about it, other than it will be set in Ireland in the 1820s, and is based on true events. I was interested in the herbal cures that Natan made - are these recipes ones you researched and were used at the time, and do you know if any of the same cures are used now? I'm not sure if any of the herbal cures are used to this day, but those mentioned in the book were absolutely drawn from research. Many of the plants mentioned (Icelandic Angelica in particular), are still used in herbal medicine for their wonderful properties, but probably not in the same fashion as they were used then. How did a student in Austrailia end up on an exchange in Iceland? I found the latter part of the book after Agnes has learned that she has six days left to live up to the very end at the excecution very harrowing reading, I had to keep stopping to gather myself together. It is a very good piece of writing indeed and I wondered if it was as difficult to write as it was to read or were you able to distance yourself from what was happening to her whilst you got on with the job of finishing the book? I nominated Iceland as an exchange destination because I had never seen snow before! I was very keen to experience a truly northern winter. Many thanks for your kind words about the novel's ending, MarionHalcombe. It was a very difficult section to write. In fact, I wept as I wrote it. Even when I returned again and again to that section during consequent edits, I could not remove myself emotionally. It was exhausting. I'd like to ask Hannah - how did you build Natan's character? I felt myself ranging between feeling sorry for him and disliking him for how he treated others. The way he met his end was horrific, but I got the impression Agnes was trying to 'help' him. What a complex story, but it did bring out the twists and turns that can result in a violent offence as those involved feel increasingly emotional and aggrieved. Is there another novel in the pipeline? Thank you for your generous comments whenim64. Natan's character was largely drawn from the historical record; there are a great many local histories that focus on his life and accomplishments, and his many contradictions. He was certainly a womaniser, a great healer, a thief and a man ahead of his time. I would have liked to spend more time talking of Natan's great accomplishments in the book, but unfortunately that was impossible. Natan's character is made known to the reader in an indirect way – largely through the opinions of those who disliked him. It would, for instance, have been difficult for me to have Agnes extoll his virtues when she's remembering him from a position of grief and bitterness. Did you find any evidence to suggest that this is how Agnes was involved ? Or was it just pure speculation...or wishful thinking on your part ? It was informed speculation based on likelihoods, rather than wishful thinking. As with all crucial events in the novel, when I couldn't find out the actual facts I let my broader research into the characters and times suggest the most likely scenario. There were several things that didn't add up regarding the circumstances surrounding the murder and fire. It was thought at the time to be premeditated, but certain evidence pointed in a more complex direction. A wonderful gripping, enthralling and mesmerising read with the descriptions of rural living in those days in Iceland forcing me to turn up the heating. As others have mentioned the way Agnes' last few days are portrayed is a very moving piece of writing. Do you think a man in the same circumstances that befell Agnes - abandonment, poverty and perceived loose morals - would have suffered the same fate as she did. Perhaps not, although one can never be sure. Men, like Agnes, were certainly born into impoverished circumstances that drastically limited their opportunities in life. Many people on the lower rungs of Iceland's social ladder were there because they lacked a kinship network, as Agnes did, and many men turned to petty crime as a means to better their circumstances, or gain some kind of agency and independence in their lives. This said, I doubt they would have been quite as vulnerable as women. After all, they would never have faced the difficulty of falling pregnant and losing their employment as a result. Has there ever been a move in Iceland to have Agnes pardoned posthumously or at least have the circumstances surrounding the killings looked at again? Many thanks for my copy of the book. I will certainly look out for your next. Over 150 years after Agnes was killed, something happened which resulted in Agnes and Fridrik's bones being moved from their unmarked grave near the site of their execution, to consecrated ground. I'm being intentionally vague when I say 'something' – it involves the supernatural, and is a story I feel I have no authority to tell. But yes, while there has been no official pardon to my knowledge, there has been a local, informal move to forgive the condemned. The weather plays a very important part in this novel, has Hannah used her personal experience and feelings when describing it ? Was it difficult to "fill in" the unknown, ie away from the legal papers ? Thank you for such an exciting novel. I certainly drew on my own experiences of Iceland's extraordinary weather when writing this book. Iceland's landscape made a great impact on me when I lived there as a teenager, and I wanted to pay homage to it in this novel. It is as beautiful as it is hostile. It wasn't particularly difficult to 'fill in' the areas of story where I faced a paucity of historical documentary evidence. I often used broader or more general research into the lives of early 19th-century Icelanders to come up with a likely scenario. Intuition also played a large role when it came to facing absences in the historical narrative. Does Hannah Kent believe in the death penalty? A brilliant book,all the more so for being Hannah's debut novel.Would definitely read more from Hannah. Thank you so much for your kind words. I do not believe in the death penalty. I firmly believe that no one has the right – government-sanctioned or otherwise – to take another's life without their express permission and blessing (such as is given in cases of euthenasia). I would like to ask whether Hannah has returned to Iceland other than on her first exchange visit and for her intensive research. What she actually thinks of the country as it is today and how on earth she acclimatises, given the polar differences of temperature and hours of daylight between Australia and Iceland? I have returned about five or six times to Iceland now, such is the grip it has on my heart. I get rather homesick for it, and of course I miss my friends and 'Icelandic family' there. I try to visit every couple of years. Iceland has always been an unusual place, and it remains unique to this day. Even though it is now a rather modern and cosmopolitan country, traditions still have a strong place in Icelandic communities, and are still deeply respected. I see many of the same qualities in modern Icelanders as I noticed in the historical figures I researched: a love of literature; stoicism; a deep attachment to the land; nationalistic pride. Iceland's soul has not changed with time. In regards to acclimatising, it's always a difficulty! I actually find the jetlag more challenging than anything else. It's a lot easier to dress warmly and get on with indoor activities in a bleak winter, than it is to suddenly switch into a drastically different time zone! As with anything, it takes patience and time. I have not yet read my copy of Burial Rites. The print is so small and as I had a cataract op.recently, I have not yet got reading specs. Can you tell us why the print font was so small please. We are, by default, all grans, though necessarily optically challenged, like me. From the posted comments, the book has gone down well, and so I look forward to reading it in due course, specs permitting.